Note: The audio of this piece is in Dia-phonic system, created by José Val del Omar in 1944. It means the speakers must be as follow: R-Channel in front of us and L-Channel in our back. Synopsis: A woman sacrifices herself in a technological scene, in front of virtual witnesses and streets coexisting in time in different places. The screen is the suicide note, the physical support of a protest that overflows through an invisible mechanism that activates the self-destruction sequence. It is the suicide note that burns and sets fire to the woman, becoming the bonfire of her protests. A collaboration of Zona NN, Monster Study, INTACT Project. In this 2nd phase, our aim was to overcome the previous stage avoiding the web-interface, because it is a dispensable mediation. In order to this, the idea was to provide the screen with a sensible area, in real-time: we define an area on the screen and the program recognises colors and luminosity parameters; the variation of this values will be translated into commands that are able to trigger remotely other devices”, always through Internet. In practice, it was decided to perform an action in which three spaces were connected: a house, a street and a terrace. In the first one, an actress is captured by a camera, and she activates with a lighter the sensitive area of a screen that is projected in the terrace. At the same time, in the street, other camera captures the urban space and transmits it on other projection in the same terrace, serving as background for the previous scene. When the actress activates the right area, the system sends an order to a computer in the terrace that controls a mechanical arm that turn on a match. The movement of the arm turns on the match and burning the paper screen where she is projected. All of this action was recorded by a camera, and in this way we obtained a video-creation produced in real-time, using telepresence systems. 1) The systems capabilities to transport a physical phenomenon (like fire) from one place to another, going well beyond the mere representation, as it becomes tangible. We define a property that needs to be recognized in a particular zone, in this case a light source, and we activate it. If activity in this sensitive area is detected, the system sends a message, via internet, to another computer which is connected to a microprocessor (Arduino) and a lamp. The message instructs the Arduino to let pass electricity to the lamp while there is activity in the above defined zone of the video. In this exercise, the “message” that sends the active area of the video has two components: To move the arm of the servo-motor and activate the electricity that, at the same time, warms up the metal which lights up the match. “We are the nervous terminals of the collective retina” (José Val del Omar). Each machine connected to the network, each workstation or terminal is a node; client and server: Huésped *. 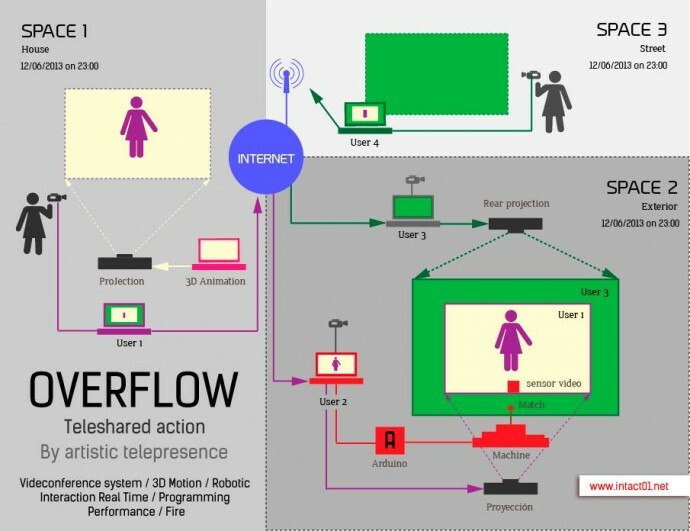 The overflow of telepresence is aimed at the immersion in the technological scene. This scene has special features; it is not a single scene but multiple interconnected scenes, full of simultaneous acts that draw up the plans and dimensions where lives the technological subject. In this sense, telepresence moves all the axes of the space. The interconnection of these places extends the bridges between one space and another, stressing the perception. The technological bridges allow transit to the inhabitants of other spaces, overflowing to the subject. Through the expanded telecommunication systems, we can be simultaneously in different places and at different speeds. At this point, the individual projects his body beyond the local space and begins its hybridization: An ongoing dialectic between the counterpoints of the ubiquity and the physical world that the subject is in. Once you have established connections between the nodes (the network) and the digital messages have been reinterpreted between a terminal and another, leaving two things: Reconfigure the local space from the “huesped” (guest) dimensions and project it towards the other terminals (remote). However, the phenomenon to be aware of here “is not the simple entity or its mode to be present, but the arrival to the presence; an arrival is always new, whatever the historical device that appears in what is given” (Reiner Schürmann, Le principe d’anarchie). Thus defines the ontological ektase of the human being, his co-belonging to each living situation. The fire of a lighter is able to light a match in another city that sets fire to a projected body. It is the picture of the same subject that turned on the lighter. In other words, a blowing here moves a mill thousands of kilometers away. At this point the imagination is triggered and the new relationships can be so absurd and nonsensical or as well poetic or literal. “We don’t have to enlighten the men; we have to, emotionally, set the men on fire” (José Val del Omar). Through capture sensors or computer re-programations of the video in real time, a breath, heat, or any other act/physical accident becomes a message of digital nature, that travels through the cyberspace and rebuilt into another act/accident in other spaces. In these reinterpretations of actions and reactions, causes and effects on the network, pivots the reality. It is important that the technological means are able to connect also to the subconscious, and to suggest collectively and to shock. For this, it is necessary to demolish the space, endowing it with mobile features, of layers that give new dimensions to the planetary subject; it is not the technological subject that moves, but the space transformed in a vehicle for its telematic travels. The multiple dimensions and configurations that contain and are contained by the network open the door to new sensitive experiences and therefore to a redefinition of the presence in relation to space. The presence ceases to be an attribute by itself. “What we need to bring is not the evolution of the presence in its journey toward the final stability, but the different ways in which it is given, the different economies of presence” (Tiqqun, contribution to the ongoing war). Telepresence should go beyond the incorporeality of vision and hearing as a result of the communication at a distance. It is essential to invent devices capable of reproducing bodies or concrete manifestations in the remote spaces, capable of changing the landscape in all directions: a new form of tactile communication that can replicate actions, create bodies and substances through “messages” that travel and arrive by means of the Internet network, in whose code is the genetic of the new specie.